London – Wednesday, 28th January 2015 – St Neots, Camb’s Tommy ‘Da Gun’ Martin has the biggest fight of his young career this coming Saturday, when he challenges Carshalton’s Ricky Boylan for the vacant English Super Lightweight title, on the Eddie Hearn, Matchroom Sport promoted CAPITAL PUNISHMENT mega show, at the O2 Arena in Greenwich, London. Tommy, who’s just twenty years of age, has already amassed a career record of ten bouts, ten wins and three of those victories came by way of stoppage finishes. Back in April last year, Tommy secured his first Championship win, the British Masters Bronze, with a shutout points victory over Michael Maloney. Whilst young Tommy was busy celebrating his success, he was totally unaware that this victory had bought him to the attention of the UK’s two top promoters Eddie Hearn and Frank Warren. After meeting with both, Tommy decided that the chance to fight on the huge Matchroom Sport shows, whose events are broadcast live on Sky Sports, was his preferred choice. As such his next fight see him travelling to Liverpool to face Ainsley Seivwright on the undercard of the Matchroom Sport promoted Tony Bellew versus Julio Cesar Dos Santos WBO International title fight. With another solid victory under his belt, Eddie Hearn decided to really test his latest signing, by having him face Southampton’s Matty Tew in a ten rounder, needless to say Tommy came through with flying colours, stopping the highly experienced Tew in the seventh round, in doing so earning the right to make his first challenge for a major domestic title. Following one of his final training sessions, a clearly elated Tommy spoke briefly about the upcoming showdown with Ricky Boylan. “Yeah I’m over the moon, absolutely over the moon with it. I’ve been training really hard for this for eleven, twelve weeks or so, I literally had a week off after my last fight and got straight back into the gym as soon as I heard the news about getting a shot at the English title. I’m taking this opportunity with both hands, it’s what I want, I want to be fighting for titles, that’s why I’m boxing I want to be a Champion, not just any champion, I want to do this the old fashioned route, English, British, European and then go for the big one – World. Everyone is saying this is as genuine a fifty-fifty fight as they come, not just the fight but also those forecasting the result. A lot of people are saying Boylan and an equal number of people are saying Martin, to my mind it is all going to come down to which Ricky Boylan or which Tommy Martin turns up on the night. I honestly believe my plan A will be better than his plan A and my plan B is better than his plan B.
I can’t see him out-boxing me and I can’t see him out working me, I think I will be too quick and too sharp for him. Winning the British Masters for me was a massive stepping stone, I absolutely loved the moment, it was an excellent stepping stone for titles like this one I have coming up. It gave me my first experience of Championship boxing, which puts me on the front foot on Saturday as I have already fought a title fight. I want to say a huge thank you to close to five hundred fans that are coming down to support me on Saturday night, I really appreciate you getting behind me it means everything to me and hopefully I’ll give you a really good show and if all goes to plan I’ll have the English belt round my waist at the end of the night. 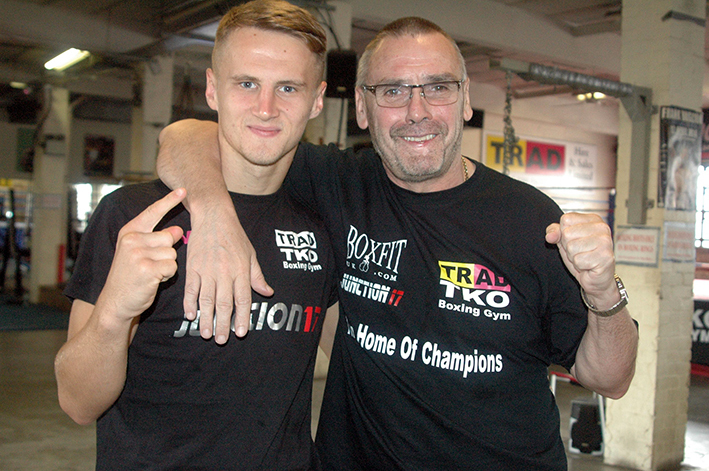 Tommy’s manager, the esteemed Champions TKO supremo Johnny Eames then spoke about his young charge and his upcoming showdown with ex TKO fighter Ricky Boylan. “This is Tommy’s biggest fight to date, what’s more it’s against an ex-TKO fighter, Ricky Boylan. It’s a genuine 50/50 fight, you can toss a coin to see who is going to win this one, it really is that close. Obviously I lean towards Tommy, or else I wouldn’t have taken the fight on, but it ain’t going to be a push over. Ricky comes to fight, he prepares himself well and he’s trained by my old mate Jamie Moore, with the Manchester boys, so we know he’s going to be well prepared.